Do you want to announce coming of the age in style? 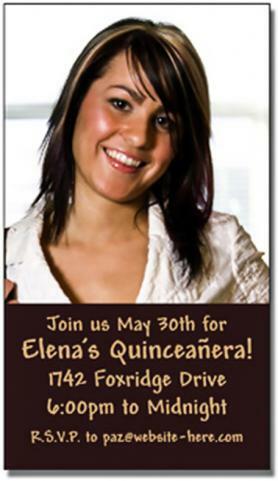 Perhaps you should consider these 3.5x2 custom Quinceanera save the date magnets 20 Mil square corners right away. These personalized announcement magnets will carry your full color photo, message and other details with confidence. Your recipients will retain them over their refrigerators as a reminder and a memoir. Order today to get started with these custom printed magnets in style. Request a quote to know discounts that you can avail on bulk ordering these 3.5x2 personalized Quinceanera save the date magnets 20 Mil square corners.